Involuntary unemployment is a situation where workers are willing to work at the market wage or just below but are prevented by factors beyond their control. These factors could include deficiency of aggregate demand, labour market inflexibilities, implicit wage bargaining and efficiency wage theory. 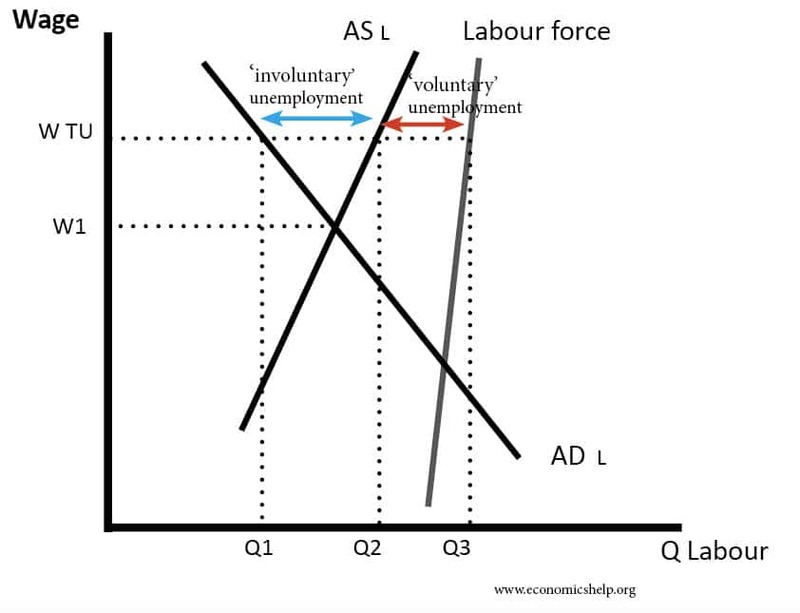 In Keynesian theory, involuntary unemployment is associated with insufficient aggregate demand and so is closely related to demand deficient unemployment. Other economists such as Stiglitz and Shapiro point to efficiency wage theories causing wages to rise above market equilibrium. Implicit contract theory. Theoretically, unemployed workers may be willing to accept a job for a lower wage rate than market wage. However, in practice, there are difficulties in actually offering a lower wage. There is an implicit understanding that workers shouldn’t undermine workers in work. It would be socially embarrassing to take a job off your friend by undercutting their wage rate. Therefore, workers are unwilling to actually offer to take jobs for lower wages. Trade unions. If trade unions successfully bargain for wages above the equilibrium, then those ‘outside’ the trade union are prevented from accepting a job at a lower wage rate. Efficiency wage theory. This theory states that firms pay workers above the market clearing wage rate because it improves the productivity of workers. By paying a higher wage, workers are more attached to their job and work harder to avoid losing it. The efficiency wage theory states why wages are above the equilibrium in the first place. Involuntary unemployment and deficient demand. In the Keynesian model, one reason for involuntary unemployment is deficient aggregate demand. If aggregate demand falls, this leads to involuntary unemployment because wages are ‘sticky downwards.’ Cutting real wages will not solve this unemployment because cutting real wages will lead to further fall in aggregate demand. The solution is to increase aggregate demand. Adaptive expectations – According to E. Phelps workers and firms may set wages based on adaptive expectations (e.g. high inflation in past causes them to demand rise in nominal wages). This can cause wages above market clearing levels. In this diagram, the ‘involuntary unemployment’ is the unemployment caused by wages artificially kept above market equilibrium (in this case trade unions). In theory, the unemployed would work for lower wages but are prevented. “Men are involuntarily unemployed if, in the event of a small rise in the price of wage-goods relatively to the money-wage, both the aggregate supply of labour willing to work for the current money-wage and the aggregate demand for it at that wage would be greater than the existing volume of employment. …It follows from this definition that the equality of the real wage to the marginal disutility of employment proposed by the second postulate, realistically interpreted, corresponds to the absence of ‘involuntary unemployment’. Robert Lucas argues there is no involuntary unemployment as the unemployed will always be able to find some kind of work. Lucas explains unemployment through real business cycle theories and changes in workers preference for work/leisure and productivity. Real Wage Unemployment Real wage unemployment (classical unemployment). In classical model wages above equilibrium (e.g. caused by trade unions) will cause involuntary unemployment. Reducing power of trades unions will solve unemployment.